Exploring Creation with Astronomy, 2nd Edition by Apologia Educational Ministries is written for elementary students who are interested in learning about astronomy with a biblical viewpoint. 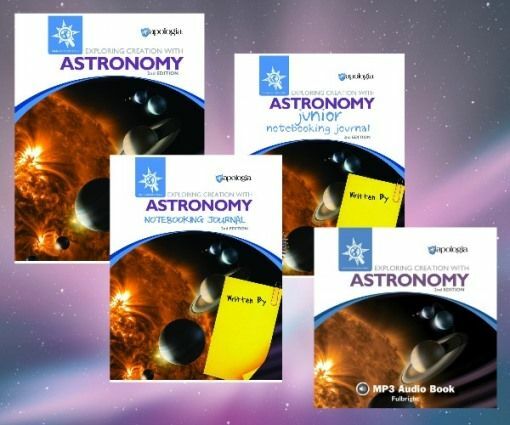 Apologia Educational Ministries provided us with Exploring Creation with Astronomy, 2nd Edition student text, Notebooking Journal, Junior Notebooking Journal, and Audio CD. There are 14 lessons within the program. Each lesson is divided up into smaller sections. Each lesson has at least two hands on activities in the textbook. The activities range from creating something physically to challenging learners’ mental capabilities such as creating their own mnemonic device. Within each lesson, there are also critical thinking opportunities titled “Think About This” and a comprehension section called “What Do You Remember?”. The suggested lesson plans are found in the beginning of the student journals. The textbook and the journals work together to complete the program. It would be rather difficult to use one without the other. The textbook provides the content for the lessons while the student journal provides the opportunity for interaction with the subject. We were provided both of the astronomy journals for the review. The activities in both journals correlate with textbook lessons, but there are a few differences. For instance while both journals have crossword puzzles the Junior Astronomy Notebook has letter hints for the young astronomer, and the "What Do You Remember?" questions are printed within the upper level journal while in the Junior Astronomy Journal there is a coloring picture and Scripture on the correlating page. Both journals have plenty writing opportunities including mini-books and comparison charts. The course also has an additional science kit for more projects. The projects are mentioned in the lesson planner, but they are not required for the program to be successful. The Field Trip Journal is also a nice supplement for those who enjoy incorporating outings into your studies. How are we using Exploring Creation with Astronomy? We are following the recommended schedule that is provided in the student journal. The journal has a daily assignment checklist. The division of the lessons isn't set for a particular number of days per week so we are able be flexible with the days we choose to complete our astronomy lessons. We currently do a daily assignment three days each week. This schedule works well for us. The lessons have many different activities like creating mini-books, copywork, writing assignments, and creating scientific tools such as a radar. Since there are a variety of assignments each day is different. Not all days do we use the journal, and there are some days when we do not have content to read for the lesson. On most days, we review the previous day's work before moving on to the current daily assignment. This is our first time using a homeschool science program from Apologia, and the girls and I are really enjoying it. I like how the lessons and text are clearly written. There’s no need to guess what the author is saying because she speaks clear, and the content is truly written for her desired audience. I appreciate that although the science is faith-based there is also scientific facts and vocabulary included. We will continue using the Exploring Creation with Astronomy as our homeschool science curriculum because it is a good fit for our homeschool.